The Taxpayers of Canada are being taken for a ride on the Harper Land Express and are being forced to pay the Conservative Party of Canada for the cost of 'Hiring' Senator Mike Duffy to go about the country and promote their candidates in the 2011 Federal Election campaign. And this just a couple of months after the Harper Conservatives copped a plea to avoid having four of their own charged with tampering with the funding in the 2006 election. They Plead guilty to Election fraud to get their minions off paid an insultingly small fine and now we are being forced to pay one of their most vocal and distasteful minions to dupe us into giving them a majority government? That does ^NOT sound right. I must have misread it.
" Party spokesman Fred DeLorey said Duffy was not paid any fees to attend events and said no Senate resources were used. "During the campaign, Senator Duffy was very helpful and went where he was asked to go, by both national and local campaigns," DeLorey said in an email. Among Duffy's whistle-stops was a trip to Yellowknife to support Conservative candidate Sandy Lee in the riding of Western Arctic. That event proved controversial as a local radio station claimed it had been refused an interview unless it submitted a written list of questions in advance. The Lee campaign paid Duffy $209 under the category of "miscellaneous expenses or non-candidate travel." She lost out in the May 2 vote to incumbent New Democrat Dennis Bevington." No, it appears that I read it correctly. So who exactly is this Mike Duffy Character? 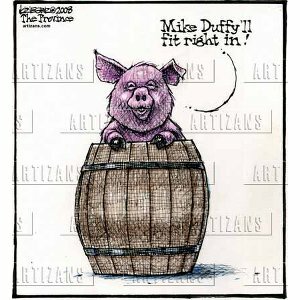 Check out this video of a drunken Mike Duffy, "off to the RCMP BALL and in a foul mood. Isn't he charming when he is drunk? Perhaps the most telling video that I have seen is this little bit of footage of Mike back when he was still looking for that Senate seat that he now fills to overflow. Watch as Elizabeth May makes ground pork out of the then Mr. Duffy. So, as you can see, we are once again having to pay our own government to misinform us. Finally: This is the kind of sycophant that Duffy has always been. He was never a journalist, just a shill. Watch now to see what it is that we will actually be asked to pay for. Here he shills as a deranged Conservative avatar and in the process, making big bucks to spread a message that he knows is not true. He does not seem to remember Paul Martin, but credits the Harper Government with saving us from the Banks. What a maroon! I recently had the pleasure of meeting Senator Jim Munson and he told me that when he and Mike Duffy were both employed at CTV he once heard Mike say that he would be willing to back PM Chretien as long as he would eventually become a Senator. He was willing to do anything then and he is willing to do anything now, so I now know that it was not an exaggeration. Pork barreling on a huge scale! I watch these 'interviews' and wonder how many times people (Mike Duffy) can tell lies about other credible people ie. Elizabeth May and show us the truth of who they are (Mike Duffy) before they are 'outed'. Thanks for all the hard work you do keeping 'us' informed. I really appreciate it. He is a square pig in a round hole. This is totally off topic but I must share this: Has anyone ever thought about what the offspring of Jane Tabor and Mike Duffy would look like? I hold them fondly in a special place that I have created just for them but I am forbidden by the rules of this blog to say more!It ain't pretty.